Oil and acrylic on canvas; 275 x 255 cm. Olav Christopher Jenssen (born in Sortland, Norway, in 1954) studied from 1976 to 1979 at the Statens Håndverks- og Kunstindustrieskole in Oslo, and from 1980 to 1981 at the Statens Kunstakademie in Oslo. He continued his studies abroad, first in New York and then in Berlin until 1983. Now living and working both in Berlin and in Lya, Sweden, Jenssen was in 1996 appointed Professor of painting at the Hochschule für Bildende Kunst in Hamburg as a successor to Sigmar Polke. He first participated in exhibitions in 1977. 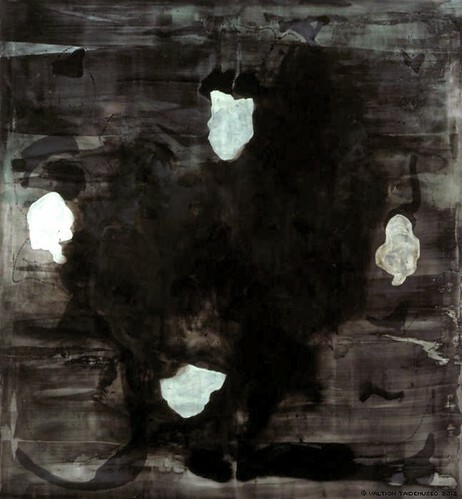 In 1992 Jenssen participated in the Documenta IX in Kassel, where the Lack of Memory series was exhibited together with works by Bruce Marden and Jonathan Lasker. An exhibition of Jenssen's works was held at Studio N at the Museum of Contemporary Art in Helsinki in 1993. He has also had solo shows in Finland, for instance in Galerie Artek in 1988, 1991, and 1995, and at the Nordic Art Centre in 1993. Olav Christopher Jenssen's paintings may evoke a trace of a romantic-mystical landscape painting, combining the artist's experience of nature and his inner landscape, the landscape of the soul. This interpretation has its origin in the strong Scandinavian tradition represented by the landscape painters of the 1800s and artists such as Carl Fredrik Hill and Edvard Munch. The romantic depiction of nature with religious undertones is often supported by the artist's own strong, expressive interpretation of the subject. Nevertheless, taking into account the sign language associated with the paintings, Jenssen's misty and hazy landscapes can be regarded from a novel point of view. In Jenssen's paintings the border between the figurative and non-figurative is blurred. In his early works he used recognisable forms as part of a composition. Later in the 1980s the shapes used by the artist suggested the smallest particles of living nature, such as plant tissue and protozoa. In his works Jenssen uses signs and texts improvised by the free movement of a hand. Their origin refers to subconscious automatic writing, which was used as a method of surrealist art. Indeed, Jenssen admits to being influenced by Paul Klee. He maintains his spontaneous working method by drawing constantly, even when he is travelling. By marking down in the drawing the time and place of its creation he connects the work with the present. For Jenssen, drawing is a way of clearing and analysing the relationship between forms and objects, which he claims not to be able do to by thinking alone. He finds all his paintings and drawings to be of equal importance and worth preserving. A past subject or form may resurface, as a stimulus for a new theme. The 1980s saw an increased interest in painting. Paintings emphasised figurativeness, expressiveness, and an airy picturesqueness. The post-modern trend also toyed with elements and subject matter connected with earlier trends. During his stay in New York in 1981 Olav Christopher Jenssen became acquainted with the abstract impressionism of the 1950s, representative of an informal and non-figurative style. This contributed to Jenssen's understanding of an abstract form language. These ideas he combined with the tradition of romantic landscape painting. Jenssen was also interested in decorative, ornamentally-shaped details, accentuating the surface of the painting, and the strong vertical or horizontal divisions, which find a softer interpretation in his works. His move to Berlin in 1982 took Jenssen into the very heart of a vigorous and emotionally appealing painting centre. The politically sensitive phase in the still divided Germany was reflected in the artists' expressive and fierce way of painting; their works dealt with grand, mythological stories or depicted the frenzied, urban lifestyle. Jenssen, however, finds his own range of subjects in quiet and inconspicuous everyday life, which in his productions is transformed into an uplifting and insightful experience. After an intensive 2-year painting session Jenssen completed in 1992 a group of forty large paintings entitled Lack of Memory. The paintings Aphasia, 1990-91, Lapidary, 1991-92, and Serpentine, 1992. The name of a work is an important part of the painting process. The name provides the work with a finishing touch, its ultimate meaning. For Jenssen the concept of Lack of Memory means the absence of memory as distinct from a 'lock of memory', the loss of memory. This general concept refers to a moment of standstill, an emotion here and now which is isolated from the ballast of memory, the past, or the future. The Lack of Memory series proved an important turning point in Jenssen's career. The long painting process allowed him to experiment with various working methods. He used different techniques in different paintings, such as spreading the paint on the canvas with a brush, by hand, or with a palette knife. Colour schemes were chosen both from the sensitive dark shades and from an expressive palette, non-primary colours such as green, purple, and orange. Instead of the basic forms of a triangle, square, or a circle, Jenssen used free forms which could be associated with nature. The painting does not let on whether the subject depicted is microscopically small or whether the spirals refer to something larger such as the stellar system, for example.